Game day is a day of epic eating. Dips with more layers than necessary, deep-fried everything and sodium levels that reach new heights. But don't get trapped in the routine of boring chips and salsa or bland wings. These seven recipes take your favorite game day foods and give them an extra punch. Extra cheese, more bacon, melted chocolate and even ice cream. Game on! What do you do when you want nachos, but you are also craving pizza? Make nacho pizza with all the beefy ingredients you love laid out as a pizza. Almost a Korean version of poutine, these fries get some love from Korean beef, kimchi and spicy mayo. There has to be a sweet option on Sunday, and what better way to serve dessert than in sandwich form—especially when it involves melted chocolate and sticky caramel sauce. What is better than a cheeseburger? How about twice the meat and cheese? Chopped bacon is mixed with pork and two types of cheese are melted on top this massive burger. Boring chicken wings be gone. 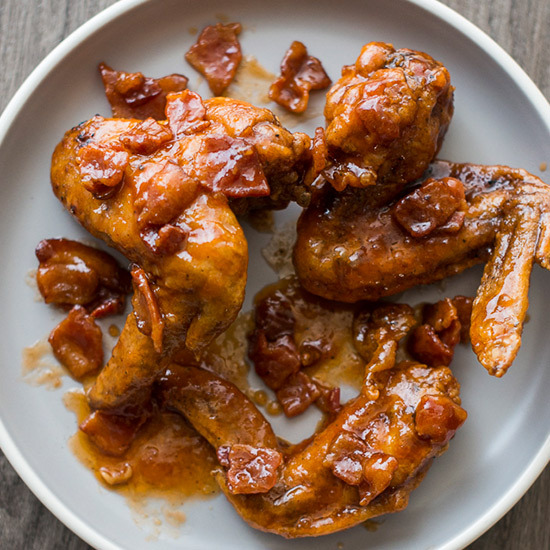 Toss them in maple syrup and bacon, and you will never go back to Buffalo sauce. Hearty chili gets even more rich with the addition of dark chocolate ice cream. That's right, ice cream. This is some serious chili.